If you are buying computer office chairs for employees, you probably already know that a healthy employee is a productive employee. You probably also realize that a person's environment and comfort level is directly related to their health, which is why giving your employees the benefit of ergonomically designed chairs can improve their job satisfaction and performance. Whether you are looking for office chairs for your home or business, we have you covered. 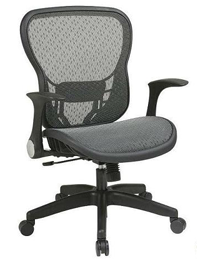 We offer several quality ergonomic chairs to help you and employees stay as comfortable and productive as possible. Our product line includes armless chairs, rolling chairs, and high-back chairs. Anyone who sits in front of a computer for more than a couple hours a day knows the value of having a comfortable, ergonomic chair. If you are getting an office chair for yourself, do your back and rear-end a favor and buy one of our quality ergonomic chairs. And if you are buying chairs for employees or coworkers, they will thank you for the comfort our chairs provide. We also carry a wide selection of executive office chairs, computer chairs, reclining chairs from modern to traditional suiting your style.